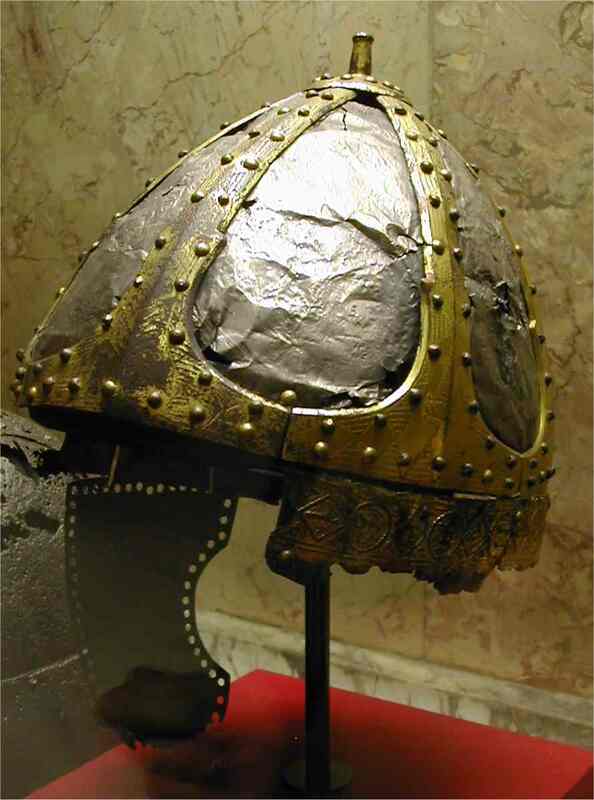 The spangenhelm, of Sarmatian origin, became popular in both Romans and barbarians because of its cheap cost of construction and the effective protection that offered. Its construction was simple, made of metal fragments which were bound tightly together. Especially towards the end of the Western Empire and after that, the spangenhelm variety of helmets became rather the most popular group. This group was also used by some Romano-Britons and their Anglo-Saxon enemies. According to legend, when King Arthur needed a new sword, the Lady of the Lake emerged from the water and handed him the sword Excalibur. The sword’s name probably derives from the Roman ‘Caliburnus’ meaning ‘steel’ and indicates the material of the blade. Excalibur’s episode is likely rooted in the known Celtic ritual of dropping the swords of mighty warriors who died, in lakes or rivers to symbolize their passage to the netherworld. Archaeologists have found countless ancient swords at the bottom of lakes and rivers of Britain and other Celtic lands. However, the Sarmatians had also similar traditions. 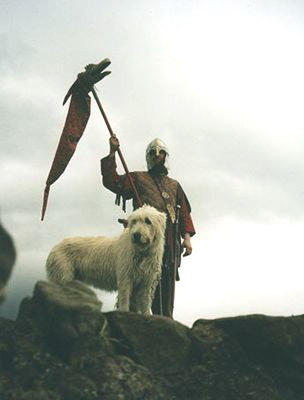 The Sarmatians and the Iranian nomads generally attributed (as the Celts did) “magical properties” in their swords surrounding them with respect, a custom which survived in the tradition of Medieval European Chivalry. Here, the Celtic tradition correlates with the Sarmatian tradition. Chretien de Troyes quotes that Arthur lived in the strong fortress of Camelot, from where he controlled his territory living a rather luxurious life. Some scholars believe that Camelot was the Roman Camulodunum (modern Colchester) because this toponym is analyzed as ‘Camelot-dun’. The Celtic word dun means the fortress, e.g. Lund-dun i.e. modern London, Lug-dun modern Lyon (Roman Lugdunum) etc. However, perhaps there were some other Briton towns also named Camelot/Camulon (Camulum). The hypothetical Camelot of the 5th-6th centuries would have been a wooden fort on a hilltop, according to the British Celtic stereotype. In 1542, John Lelant, a researcher and collector of archaeological finds, observed in modern Somerset, the existence of the River Cam and two villages known as West Camel and Queen Camel. The three toponyms are originated from the same verbal root ‘Cam’ as “Camelot.” In a distance of 7 km from the Camel villages, Lelant observed the Cadbury hill. In the 16th century, the hill was found surrounded by four rows of defensive ramparts and moats. These were the fortifications of a fortress of impressive size. Lelant thought that he spotted the legendary Camelot at Cadbury hill, but he had no archaeological evidence to prove it. 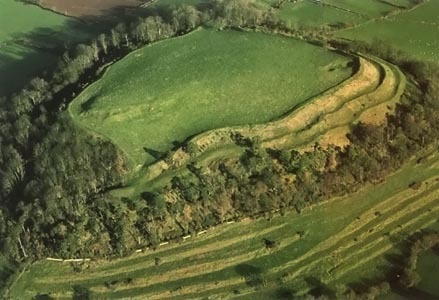 In the 1950s, British archaeologists began excavations at Cadbury hill and confirmed the existence of a large fortress of the Dark Ages. At its southwestern part, they discovered the foundations of the main gate and confirmed the existence of a wooden wall with a very long perimeter. The inner rampart was made of wood and stones, a style unique to Britain, found only in Cadbury. The fortress was dated to the 4th-5th centuries, from the utensils and other items found inside. This is probably the biggest British fort of this age, with a probable area of 7-8,000 square meters. Although only a part of its area is excavated, it is obvious that it was the seat of a powerful commander of the 4th-5th centuries. An accurate reconstruction of a seax (sachs, sax). It was a military knife, characteristic of the Germanic peoples. The tribal name of the Saxons, the main invaders in Britain, originates from the seax. The fort at Cadbury is large enough to have been the headquarters of the aforementioned (in Part I and other articles of mine on Arthur) Supreme Commander of the Briton archons and warlords (Dux Bellorum, Rigo-tamus, Riothamus). It has been estimated that 800 men were needed just to defend the walls. Given that a typical military force of that period normally did not exceed the figure of 100 men, it is obvious that only a very powerful ruler could command an army of this size, a ruler who had no equivalent across Britain. Arthur had assembled a large army just before the battle of Mount Badon (Roman Badonicus), which lies a few miles from Cadbury. An important evidence for the identification of Cadbury with Chretien’s Camelot is the conclusion of the archaeologists that the fortress was refortified with stronger defenses in the second half of the 5th century, i.e. the alleged start of Arthur’s politico-military action. The local oral tradition which associates the fort of Cadbury with Arthur or in general with a powerful king, is maintained until today. It is significant that when in the 1950s the archaeologists began excavating the hill, the local people asked them “if they had come to unbury the King.” The modern inhabitants of the region are English but their ultimate origin is Briton, i.e. their ancestors were Anglo-Saxonized. Geoffrey does not mention Camelot, but he quotes that Arthur ruled his kingdom with the support of a dedicated brotherhood of knights, the Knights of the Round Table. Geoffrey celebrates the Brotherhood and over the centuries the personal stories and deeds of the Knights of the Round Table became more important than Arthur himself. The archaeological finds from a mound in the center of the Cadbury fort, indicate the historicity of the Brotherhood. In addition to the utensils of the 5th century, the archaeologists excavated a number of pillars that were grounded to a specific order. The household utensils and the pillars were the remains of a wooden hall which covered a quite large area, appropriate for a large gathering of warlords. The archaeologists discovered in the hall evidence related to the Round Table, i.e. fragments of jugs for wine or mead. From the amount of the jugs it is evident that the warlords were gathering here mainly to drink. This was the most usual way to relax before or after a battle. The epic poem “Y Goddodin” demonstrates how the drinking and the Round Table were connected, describing how the noble fighters of the poem gathered to have fun drinking mead and wine. It seems that the Round Table was nothing more than a metaphorical performance of the bond connecting the knights (the noble cavalrymen, to be more accurate) including the King (Dux Bellorum). It is the ideal of equality and fraternity in a brotherhood of professional warriors. 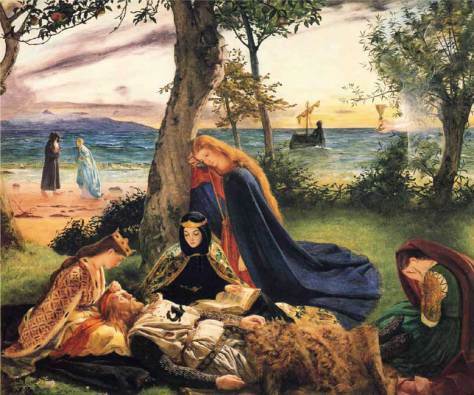 “Le Mort d’Arthur”, a classic artwork by James Archer. The noble warlords were extravagant by the standards of their time. They were carrying expensive weapons which passed them from one generation to the next, drinking large quantities of alcohol of high quality and eating expensive meals e.g. meat with pepper. The tradition of the luxurious life of the Knights in Camelot is probably based on this way of life of the Briton fighting nobles. Concerning the Round Table itself, the scholars who are looking for some such real table or related object, rather perceive too literally its image. The warlords of the Early Middle Ages were sitting circularly around the warmth of the hall’s fire, and probably this habit is the reality of the Round Table. If Arthur was an historical personality, he probably had his headquarters in contemporary Southwestern England, the land of the Dumnonii and their sub-tribes, where Tintagel and Cadbury are located. It is likely that he was a Dumnonian. However, many researchers believe that he came from other British regions, with the stronger versions being the ones of Wales and modern Northern England or Lowland Scotland (theory of a ‘Northern Arthur’)…. καλησπέρα Περικλή! πολύ όμορφο άρθρο. Η προφορική παράδοση μιας περιοχής δείχνει να αποτελεί καλό έναυσμα για έρευνες και δείχνει και το ιστορικό βάθος της μνήμης ενός λαού.Μου θύμισε την εμπειρία της ξαδέλφής μου όταν έψαχναν τον τάφο του Βιλλεαρδουϊνου και ένας αγράμματος γέρος τους ρωτούσε αν βρήκαν τον Φράγκο.ΓΙα να κάνουμε και λίγο χιούμορ γνωρίζεις την ταινία των ¨Μοντι Πάιθονς” για την αναζήτηση του άγιου δισκοποτηρου; Θυμήθηκα την σκηνή που ο αρθρουρος προσπαθεί ναεξηγήσει την νομιμοποίηση της εξουσίας του σε μια κολλεκτιβιστική αναρχική κοινότητα. Καλησπέρα Ανδρέα Ναι, αυτή η σκηνή είναι έργο τέχνης! Θυμάσαι τι του απάντησε ένας από τους αναρχοκολλεκτιβιστές όταν ο Αρθούρος προσπαθούσε να τους πείσει ότι είναι βασιλιάς τους: “Μα εγώ δεν σε ψήφισα για βασιλιά …… Και επειδή κάποια βγήκε από μια λίμνη και με κάποιες aquatic ceremonies σου έδωσε ένα ξίφος, εγώ πρέπει να σε αποδεχτώ ως βασιλιά μου?” Από τις καλύτερες κωμωδίες που έχω δει. You don’t vote for the King! Πάντως κατάλαβε καλά τι είναι the violence inherent in the system. Αλλά επίσης θυμάσαι που συστήνεται King of Britons και τον ρωτούν ποιοί είναι οι Britons. μια διαδικασία εθνογένεσης εκ των άνω. Έδειχναν σαν να μην είχαν καμμία εθνική μνήμη σαν αυτή που αναφέρεις στο άρθρο ( άλλο ότι είχαν προηγμένο σύστημα λήψης αποφάσεων ). Σαν να ήταν άλλος λαός ( εδώ θυμηθηκα το άρθρο σου για την Σκοτία. Προφανώς ήθελαν να κανουν αναφορά στο μείγμα που προέκυψε μετά τις εισβολές και έδινε την εντύπωση ότι ο Αρθρουρος δεν άνηκε στους τωρινούς βρεττανούς αφού αυτοί προέρχονταν από μεταγενέστερη αυτού εγκατάσταση ). Θεωρίες που δεν λαμβαναν υπόψη ότι δεν αντικαθίστανται εύκολα πληθυσμοί ( σαν τις φαντασιώσεις του Φαλμεράυερ και της διάστασης Ελληνων – Προελλήνων. – Νεοελλήνων ) ήταν της μόδας για καιρό! Αλλά φαίνεται να αποκτούν και οι Άγγλοι ένα ιστορικό βάθος με τις αρχαίολογικές ενδείξεις. Για μία επιπλέον ένδειξη δεν γράφω γιατί είμαι σίγουρος ότι θα την αναφέρεις. Ναι, του έδωσε και κατάλαβε! θυμήθηκα και τη σκηνη με το φοβερό τέρας-κουνελάκι…..
Μικρότερος αναρωτιόμουν γιατί οι Αγγλοι έχουν τον Αρθουρο κάτι σαν άτυπο εθνικό ήρωα, αφού κατέσφαξε τους Αγγλοσάξονες προγόνους τους. Αργότερα αντιλήφθηκα ότι οι περισσότεροι σύγχρ Αγγλοι κάθε άλλο παρά γερμανικής καταγωγής είναι, και όπως το θέτεις σωστά, εδώ μπαίνει η φυλετική-εθνική μνήμη. Οταν οι Αγγλοι μιλούν για τον Αρθούρο, νομίζεις ότι οι ΑΣ δεν ήταν πρόγονοι τους! Πάντως μεταξύ μας, η θεωρία ότι και οι Αγγλοι είναι κελτογενείς “γηγενείς” της Βρετανίας ‘ανθισε’ από το 1990 και έπειτα, δηλαδή ακριβώς την εποχή της νέας Κελτικής εθνικής αφύπνησης (Σκώτοι & Ουαλλοί [ξανα]ζητούσαν ανεξαρτησία). Υπάρχει πολιτική σκοπιμότητα ή μου φαίνεται? Παρότι η θεωρία ισχύει κατά την άποψη μου, είναι ταυτόχρονα σαν να λέει το Λονδίνο στους Κέλτες: “Μείνετε στο ΗΒ: Ενας λαός είμαστε όλοι, κι εμείς κελτογενείς είμαστε”. Aν θέλεις γράψε την τελευταία ένδειξη, επειδή είναι πολλά που δεν γνωρίζω ή έχω παραλειψει (στο διαδίκτυο αναγκαστικά δεν γράφεις πολλά). Ελπίζω να μην σε προλαβαίνω σε κάτι που θα έβαζες στο άρθρο. αναφερόμουν σε έναν τάφο που έφερε επιγραφή ενθάδε κειται ο Arthurius rex. Ναι, θα το ανέφερα στο τελευταίο μέρος του άρθρου, αλλά έκανες καλά που το έγραψες επειδή είναι η πιο γνωστή ένδειξη αλλά όπως θα δεις, είναι τελείως fake (κατά την γνώμη μου και ποολών ακόμη). Η γενετική για τους Αγγλους λέει ότι κατάγονται κυρίως από τον εντόπιο πληθυσμό. Μου φαίνεται ότι “έχεις θέμα” με τον Αντίοχο. Και έχεις δίκιο. νομίζω ότι έχουμε ξαναμιλήσει για το πως θα ήταν τα πράγματα αν είχε νικήσει τους Ρωμαίους στη Μαγνησία. Και εδώ που τα λέμε, πολλές φορές το έχω σκεφτεί κι εγώ αγανακτισμένος: να ηττηθεί έτσι, μέσα στην έδρα του και με έναν αυτοκρατορικό στρατό στη διάθεση του? Και έχω γράψει σε βιβλίο μου (Ελληνιστικός Κόσμος) πόσο πολύ τον εκτιμώ ως προσωπικότ & μεγάλη ελπίδα για τον τότε Ελληνισμό. μη μου αναβεις καημούς! το ξέρεις ότι δεν το έχω χωνέψει 2000 χρόνια μετά! αλλά επιτηδες το έγραψα!στο θέμα μας τώρα νομίζω ότι η βιολογία λύνει μεν το ζήτημα της καταγωγής και μας μένει το θέμα της μνήμης. εδώ το εύρημα είναι μάλλον μη γνήσιο όπως αναφέρεις και γι’ αυτο έθεσα το ζήτημα στην βάση της ανάγκης νατου αποδοθεί τάφος ως ένδειξη ιστορικης ύπαρξης. βλέπω δύο εκδοχές: μια ο λαός να διατηρούσε μια μνήμη και δεύτερη μια εξουσία να κατασκεύαζε μια μνήμη Αρθρουρου ( για αυτό ξεκίνησα από τους Μόντι Πάιθονς που τους Britons τους “εφευρίσκει” ο Αρθρουρος) . Στο πλαίσιο της δεύτερης εκδοχης η έρευνα καθίσταται πραγματικά δυσχερέστατη αφού κάθε στοιχείο μπορεί να μην είναι ιστορικα ακριβές. Μεταγενέστερα πάντως φαίνεται η μνήμη των άγγλων να ειναι ισχυρή για τον Robin Hood αν και μάλλον αποτελεί σύνθεση πολλών προσώπων σε ένα με το αρχικό προσωπο να εμφανίζεται ως ποινικός κατάδικος. Ένα πράγμα που με παραξενεύει είναι οι λίγες πηγές. Όταν σπουδαζα στην Αγγλία αποφάσεις δικαστηρίων του 1300 ήταν διαθέσιμες στην βιβλιοθήκη οπότε λογικά θα περίμενα έναν αριθμό εγγράφων αντιγράφων παλαιότερων έργων. στην ταινία των Μοντυ Πάυθονς πάρχει και η άλλη εκδοχή για τους Βritons: οι αναρχοκολλεκτιβιστές απορρίπτουν την ιδέα του έθνους και δεν θεωρούν ότι ανήκουν σε κάποιο έθνος. Ισως οι Μοντυ Π αυτό ήθελαν να θίξουν με την ερώτηση Who are the Britons? Κατά την άποψη μου, η έλλειψη εγγράφων αντιγράφων παλαιότερων έργων στη Βρετανία οφείλεται στο ότι το νησί μέχρι το 1100 ήταν πολύ πίσω πολιτισμικά. Απότι έχω καταλάβει, τις βάσεις του σύγχρονου αγγλικού πολιτισμού τις έθεσαν οι Γάλλοι που ήρθαν μαζί με τους Νορμανδούς κατακτητές το 1066-1100. Και αυτό επειδή οι Αγγλοσάξονες είχαν σχεδόν ανύπαρκτο πολιτισμό. Καλησπέρα. Νομίζω ότι κατά την παράδοση ( με αλανική ή γοτθική επίδραση ? ) και ο Αττίλας είχε ένα σπαθί που του το είχε δώσει ο θεός του πολέμου Άρης. Πολύ ενδιαφέρον στοιχείο. Πάντως οι Ούννοι είχαν έντονη σαρματική-αλανική επίδραση. Το είδα Ευρύπυλε, αλλά έκοψα την εικόνα του εξώφυλλου επειδή έβγαινε τεράστια στη σελίδα. Υπάρχουν λατινικά κείμενα πριν το 1066 από Σάξονες μοναχούς, πχ του Λιιντισφαρνε, αλλά νομίζω ότι δεν είναι και τόσο χρονικογραφήματα, αλλά θεολογικά και αντίγραφα της Βίβλου. Οι Κέλτες μοναχοί (Βρετανοί και Ιρλανδοι) έχουν πολύ πλουσιότερο συγγραφικό έργο για αυτό μας άφησαν και αρκετά χρονικά. Ουσιαστικά ο Τζεφρυ του Μονμουθ είναι ο πρώτος αξιόλογος Σάξονας χρονικογράφος (νομίζω ότι ήταν Σάξονας) αλλά και αυτού το έργο είναι περισσότερο μυθολογία παρά ιστορία. Ούτε αυτός συγκρίνεται με τους Κέλτες χρον/γραφους. Εχεις δίκιο για τον Ρόμπιν Χουντ, είναι σύνθεση διαφόρων προσωπικοτήτων με κυριότερες δύο: έναν τοξότη του απλού λαού (μάλλον ο ποινικός κατάδικος που αναφέρεις) και έναν Σάξονα αριστοκράτη. Κι εγώ δεν γνωρίζω πότε χρονολογειται η πρώτη μαρτυρία για αυτόν. Πάντως το άγαλμα του Ρόμπιν στο Newcastle σκοτώνει την κινηματογραφική εικόνα. ένας τύπος με κοιλια και προγούλι που δύσκολα θα τον πέρναγες για ήρωα. Ο ποινικός καταδικος βρέθηκε να υπηρετεί στην φρουρα του βασιλια αργότερα οποτε ίσως και να ήταν πιο κοντά στον αριστοκράτη. στο νού μου είχα βέβαια τους μοναχούς αλλά πιο πολύ ένα ντοκυμαντερ που έδειχνε την ανακάλυψη της αλληλογραφίας ενός ρωμαιου διοικητή που ειχε προσπαθήσει να κάψει. οπότε ίσως να υπαρχει υλικό για ανακάλυψη. πάντως νομίζωπως όιτ έχουμε μέχρι τώρα το κάλυψες. τωρα φούλ για τον Ιάσονα! Μάλλον ήθελαν να δώσουν μια ρεαλιστική εικόνα του ήρωος. Οι Ντ. Φαιρμπανκς, Μ.Γουντ, Κ.Κόστνερ κ.α. έπεισαν τους πάντες ότι ο Ρόμπιν ήταν ένας καλογυμνασμένος γόης που έλεγε συνεχώς εξυπναδικες ατάκες ενώ κινδυνευε η ζωή του. Ωραία η πληροφορία για τον Ρωμαίο διοικητή. εννοείς μάλλον κατά την εκκένωση της Βρετανίας από τη ρωμαϊκή διοίκηση. σίγουρα ο ίδιος έφευγε. για το αν ήταν εκκένωση της βρετανίας δεν το θυμάμαι.